Kickstarter backers will receive a DRM-free download. Some HUD elements are stretched. Can be zoomed in or zoomed out during gameplay. 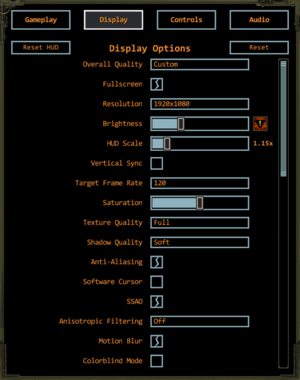 Enable Fullscreen from in-game display options. As with many Unity games, there is no Exclusive Fullscreen option available. Available as 'per texture' or 'forced on'. Also can be forced through video driver. Added with the patch 3. Uses Unity graphic settings presets. Features official bindings and Steam Controller prompts, but doesn't support Steam Controller API. Global, music, SFX, VO, ambient and UI. Raw, mono, stereo, quad, surround and 5.1. Text-to-speech option is available for visually impaired users. 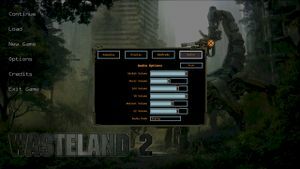 See Helix Mod: Wasteland 2: Director's Cut. Open the Compatibility tab select and enable "Run this program as an administrator". Click OK twice to save the settings and close the windows. Open the Nvidia Control Panel, which can be found as a tray icon on the taskbar, in the Control Panel, or by right-clicking on the desktop and selecting it. Go to Manage 3D settings, open the Program Settings tab, click on Add and either select WL2.exe in the window or click on Browse... and browse to the WL2.exe file (located in <path-to-game>\Build). In the dropdown menu below, select "High-performance NVIDIA processor". The developer also recommends to disable video capturing software like Fraps or Bandicam. There is currently a bug where none of the saves show up if even one of them is missing (specifically missing the .xml file or possibly having an empty .xml file). Double click on all saved installation folders until you find one that has no data in it. It's specifically looking for a .xml file. 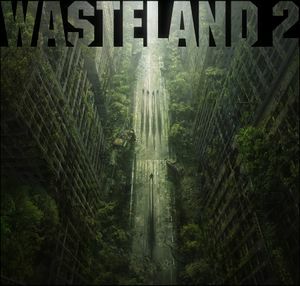 Restart Wasteland 2 and your other saved games will re-appear. Change registry key Resolution_hXXXXXXXXXX to desired resolution (e.g. 1920x1080). Change registry key Screenmanager Resolution Height_hXXXXXXXXXX to desired height (e.g. 1080) (Note: Make sure to select decimal numbers). Change registry key Screenmanager Resolution Width_hXXXXXXXXXX to desired width (e.g. 1920) (Note: Make sure to select decimal numbers). Launch game with -show-screen-selector command line argument. Now you will see a pre-launch menu. Change resolution to desired resolution (e.g. 1920x1080).